Comments Off on Putin the Emperor? Adorned with laurels, armor and a toga, a new Roman-emperor-style bust of Russian President Vladimir Putin has entered into the world. The initiative to erect the bronze-cast Putin was spearheaded by St. Petersburg Cossacks, with sculptor Pavel Greshnikov creating the likeness of the ruler. The idea to commemorate Putin came in the wake of Russia’s annexation of Eastern Ukraine, which Ataman of the St. Petersburg Cossacks Andrei Polyakov says is bringing the Russian empire back together again. This is not the first sculpture of Putin clad in curious attire. 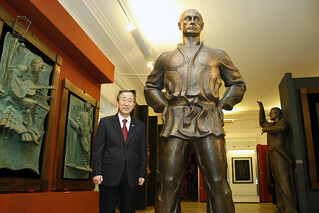 Pictured is UN Secretary-General Ban Ki-moon posing with a grandiose monument to Putin at the Tsereteli Gallery in Moscow. Naturally, the Russian President is wearing Judo gear. Putin’s bust will be revealed on May 9, 2015 (‘Victory Day’) at a metro station at the edge of St. Petersburg, the emperor’s hometown. “Cossacks Plan Victory Day Bust of Putin As Roman Emperor.” Radio Free Europe, March 19, 2015. Accessed March 23, 2015. http://www.rferl.org/content/cossacks-putin-statue-as-roman-emporer/26909584.html. Dominic Smith. “Vladimir Putin to be Depicted as Roman Emperor in Statue Built in His Hometown.” Mirror, March 23, 2015. Accessed March 23, 2015. http://www.mirror.co.uk/news/world-news/vladimir-putin-depicted-roman-emperor-5385828. “Russian Academy of Arts and Zurab Tsereteli Gallery. RusMania. Accessed March 23, 2015. http://rusmania.com/central/moscow-federal-city/moscow/khamovniki/?s=russian-academy-of-arts-and-zurab-tsereteli-gallery.